Ald. Melissa Wynne (3rd) at a City Council meeting. Aldermen discussed on Monday how to reduce cuts, provide Vital Record services and keep from burdening residents with tax and fee increases. 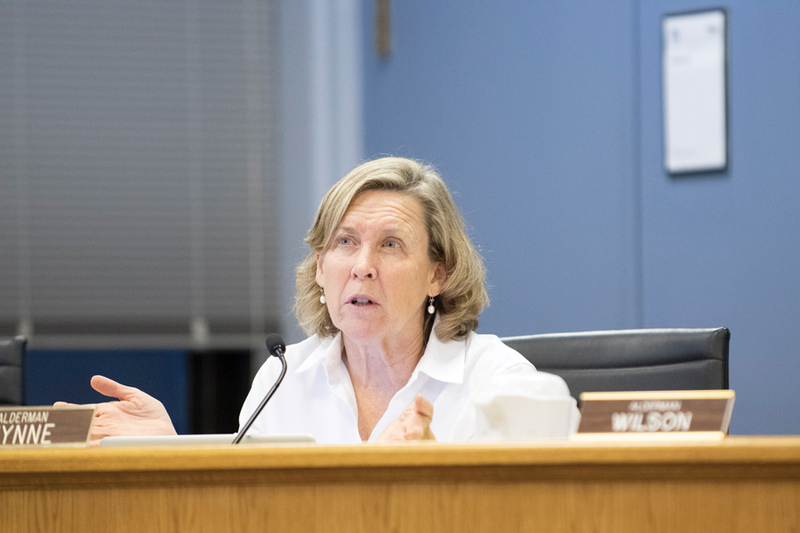 Faced with a revised 2019 budget proposal, aldermen on Monday discussed ways to reduce cuts, provide Vital Records services and keep the city from “nickel and diming” residents with tax and fee increases. City manager Wally Bobkiewicz presented a new version of the budget after residents expressed concern over department and board cuts as well as restructurings. The budget originally proposed to decrease funding for Mental Health Board by $250,000, but the new plan proposes a $150,000 reduction. Ald. Melissa Wynne (3rd) said she would like the council to not cut the board’s budget at all, saying the city could find other ways to make up the cost. The new proposal also keeps Evanston Fire Department Station 4 — located in the 2nd Ward — open. Rather than closing down the station, four firefighter/paramedic positions will be kept vacant and there will be more than $224,000 added to the overtime budget. Bobkiewicz said the budget has also allocated $20,000 for a fire department cost study. The plan similarly holds four police officer positions vacant and no longer removes the position of the civilian community engagement specialist. The council later discussed ways the city can continue to provide the services of the Vital Records program — which provides copies of birth and death certificates — without the two full-time staff members dedicated to the program. Aldermen voted 8-1 in an unofficial straw vote to keep the service run by existing staff at the Health and Human Services Department at a three-day-a-week capacity. City clerk Devon Reid disagreed with the vote and said his plan to transfer the services to the city clerk’s office would have increased the revenue from the program and made it more accessible. At the Administration and Public Works Committee meeting, aldermen expressed some qualms about increasing charges on residents for street sweeping violations, discussed adding parking enforcement officers and a transportation network company tax. The fine for street sweeping violations — which council approved for introduction with Ald. Robin Rue Simmons (5th) voting no at committee — would increase from $35 to $75. Rue Simmons said she is worried that the increased fine will unfairly harm low-income residents. But according to city documents, the fine increase would be accompanied by eliminating towing, so that would reduce “financial hardship and inconvenience.” Assistant city manager Erika Storlie said the changes would add about $350,000 to the city’s revenue, which is not currently reflected in the budget proposal. Ald. Tom Suffredin (6th) also amended the transportation network company tax — a 20-cent tax on rides from companies like Uber and Lyft — so that the tax on individual rides increased to 45 cents, the tax on shared rides remained 20 cents and the tax on rides for those with disabilities was eliminated. City documents show this amendment could bring in $280,000. Suffredin said increasing fees on taxes and parking meters will leave residents feeling less “nickel and dimed” than increasing fines on items like parking tickets.